This intriguing 1920s sewing pattern features an under-dress/over-blouse ensemble. It is incredibly chic and figure flattering. The under-dress has 2 applied tiers cut on the straight of grain but sewn onto the under-dress at a diagonal. Each tier has a loose drape section at the left side providing that finishing element to the design. Contrast bias binding finishes the edges of over-blouse and tiers. Slip-on under dress has straight silhouette with 4″ of ease at the hip. Bodice of under-dress made of lining fabric and has shoulder darts. Over-blouse has cap sleeves and bust darts. Wrong side of fabric will show in draped section; choose fabric accordingly. Also, be aware of the play of grain line in the design if you are considering fabric with a stripe or defined grain line. Dress weight fabrics are appropriate; linen, silk, rayon or cotton. Lining fabric for bodice of under-dress should be smooth, lightweight and breathable but still sturdy. 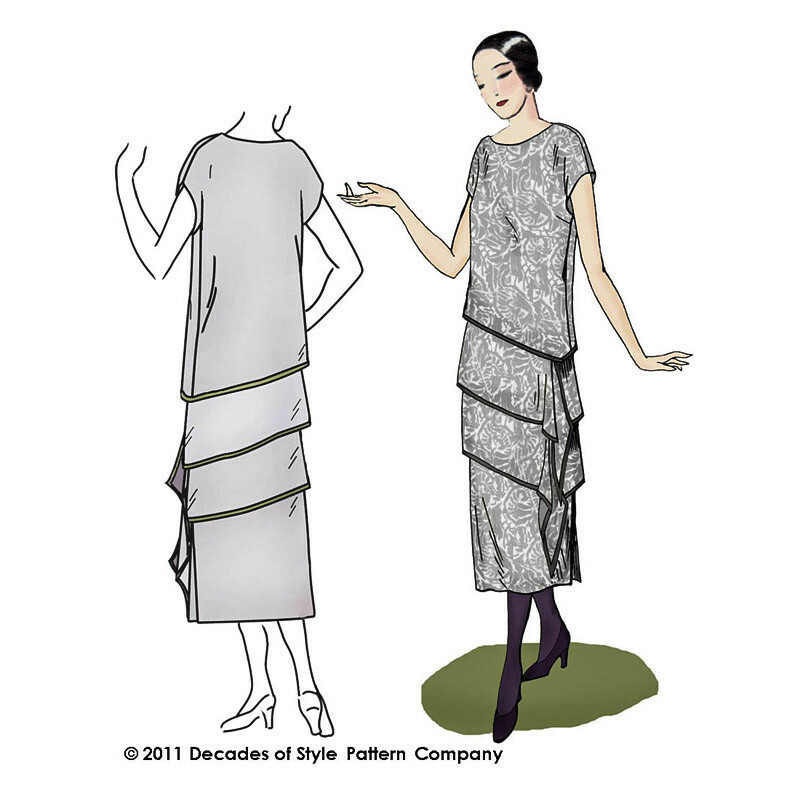 Find out more about this sewing pattern from Decades of Style here.